Emily and Adam brought Hobbes around to visit while Adam and I put up the kitchen cabinets. Adam was a wonder and put most of them up without much help!!! Hobbes greeted Alex with no problems but saw Cleo coming over to say hi and he started to hiss and spit putting his bum in the air and his head to the ground with his large ears back. The poor little thing was terrified of Cleo, Emily calls him giant cat, but I don’t think my baby is that big, just big in comparison to the babies. Hobbes calmed down a bit ad played with Alex. The two of them making terrible noises, even Emily was a bit worried they were killing each other. I told her that was exactly how I felt when they first arrived but they seem to run back at each other when you pull them apart. It took most of the evening to put the cabinets up but they were easier then we all thought, thank you IKEA! 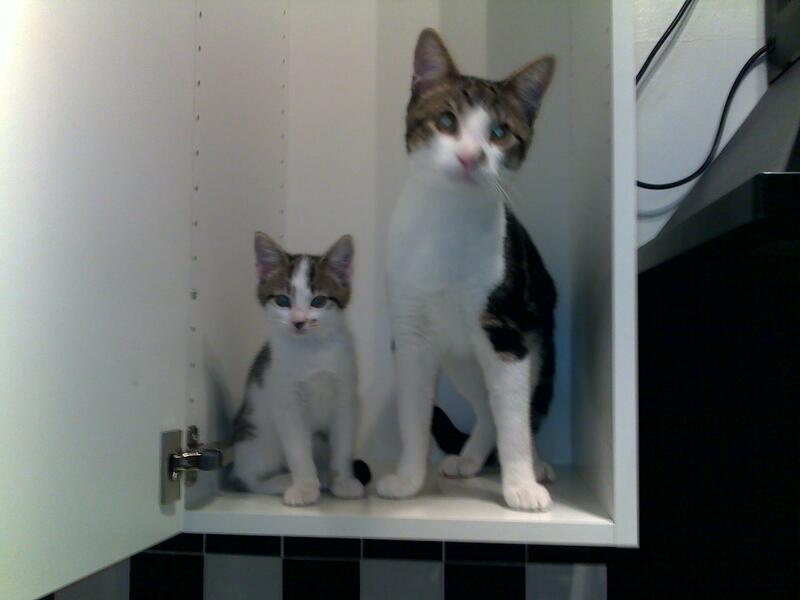 When we had finished and Emily, Adam and Hobbes had gone home Cleo and Alex started sniffing around the new cabinets. I put them in one so they could sniff around, guess it passed inspection.